We are located in the Williams Bay/Lake Geneva regional area (shown below) and are in close proximity to many major metropolitan areas in Illinois and Wisconsin. Take Galena Road west to Highway 47. Highway 67 north to Williams Bay. Turn right on North Lake Shore Drive. Turn left on Ravinia Drive. Exit Highway 50 west for about 30 miles through Lake Geneva and then five miles further. Highway 67 south to Williams Bay. Proceed through Williams Bay and turn left on North Lake Shore Drive. Highway 67 north (and east) toward Williams Bay. Highway 14 east through Darien. Left on S & D Town Line Road. Right on County Highway O. Left on Walworth Road, which becomes Highway 67. Interstate 43 north (east) at Beloit to Delavan. Exit Highway 67 south to Williams Bay. Interstate 90 west (NW Tollway). Continue through Williams Bay on Highway 67 to our entrance sign. Turn left onto North Lake Shore Drive. Turn left onto Ravinia Drive. The two closest airports are in Milwaukee, Wisconsin and Chicago, Illinois; see below for detailed airport information. Milwaukee's Mitchell International, located about an hour from George Williams College of Aurora University, is the airport of choice for ease and accessibility. 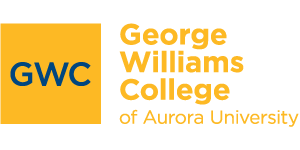 O'Hare Airport is a two-hour drive from George Williams College of Aurora University.